Creativity Prompt has launched a new self-paced workshop. 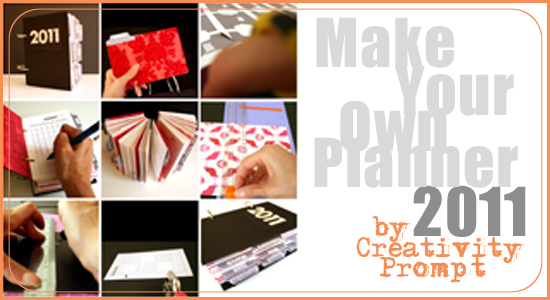 In this workshop you will make your own planner for 2011. The planner's pages are extremely modern with an industrial chic and appeal to any taste. For only $12, less than a price of one designer planner, you will get a beautiful, meticulously designed planner kit. Not only that, but you may also use the kit to create planners for your friends, family and colleagues – a great handmade and affordable present for the coming holidays. You may also alter the JPG files, change their color, add or subtract elements and personalize it with a photo editing program. The workshop guide also provides tips and suggestions on how to harness your creativity for customizing the planner and make it uniquely yours. Coupled with a high resolution video tutorial you will also find clear and concise written step-by-step instructions, paired with large colorful pictures of each and every step – leaving all the guesswork out of the equation. But wait, don't stop there, with the extra pre-designed pages you will get, you will also be able to make your own sketch book, diary or list booklet. Just print extra copies of these pages and bind together to create a whole different product, uniquely yours. I am so confident you will absolutely love the planner you'll make, that I am offering a full money back guarantee. If you are not fully satisfied with the workshop, just send me an e-mail and I will refund 100% of your purchase – no questions asked. Instant access to all the workshop's material. This entry was written by Angie and posted on October 18, 2010 at 3:00 pm	and filed under Calendar, Classes, Release, Scrapbooking, scrapscene. Bookmark the permalink. Follow any comments here with the RSS feed for this post. Post a comment or leave a trackback: Trackback URL.